The improving economy, low unemployment, tax cuts and lower gas prices finally proved that there is not a retail apocalypse. Pent up demand is driving a great start to the holiday shopping period. According to Adobe Analytics in on Thanksgiving Day, shoppers spend US$3.7 billion online and on Black Friday, shoppers spent US$6.2 billion in the US. Cyber Monday sales topped US$7.9 billion, making it the single largest shopping day in US history, this is largely driven by electronics, with $2 billion coming from smartphone sales alone. Mobile generated almost 50 per cent of ecommerce traffic but converted shoppers at a much lower rate than desktops. Akamai has released data for the first big shopping weekend of the 2018 season, and their data finds that conversion rates on mobile devices average 2.72 per cent, with desktops averaging 5.12 per cent. But, they also found that bounce rates are up – with mobile devices bouncing 34.71 per cent and desktops bouncing 25.74 per cent. Bounce rates mean consumers are getting blocked out and signal that the retailer must consider this a stress test and invest in digital infrastructure thereby correcting those problems. Gartner has long predicted the store will become the hub of digital activity. Traditional multichannel retailers are seeing the benefits of investments in digital as Adobe sites a significant spike in the Buy Online, Pickup In-Store trend. In fact, the NRF survey found more than 89 million people shopped both online and in stores, up nearly 40 per cent from last year. We are reaching a tipping point where ecommerce capability is no longer a competitive advantage; it has become ubiquitous. Execution is the point of differentiation. 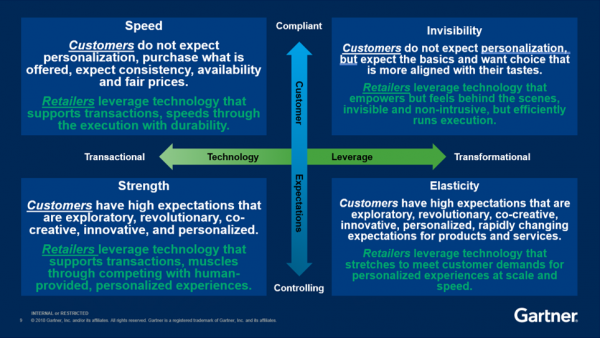 Retailers must understand what their customers expect from a digitally-enabled experience. It’s not the same for every retail brand. Delivering a brand right, reliable customer experience that takes advantage of its unique market placement is the key to success. This is true whether Aldi and Kroger, or TJMax and Macy’s.